This potent elixir, with alpine rose stem cells, delivers deep cellular support to soothe, nourish, and transform sensitive skin. Pomegranate tones and tightens as moisture-binding humectants revive skin`s hydro lipid. Apply in the morning and at night. Apply lightly on clean face and neck, prior to moisturiser. 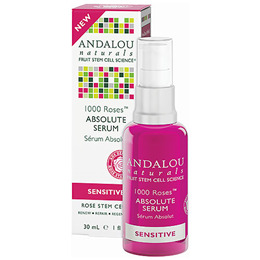 Below are reviews of Andalou 1000 Roses Absolute Serum - 30ml by bodykind customers. If you have tried this product we'd love to hear what you think so please leave a review.